Air Force cornerback Reggie Rembert is gonna need a bigger trophy case. On top of other accolades he’s already received this year, the senior has now been voted to the prestigious Associated Press All-America Team. Rembert was selected to AP’s third team along with Stephon Gilmore, a freshman at South Carolina. TCU’s Tejay Johnson and Quinton Carter, both seniors, were the first-team All-America pics. Virginia Tech’s Jayron Hosley and Oregon’s Cliff Harris, both sophomores, made the second team at cornerback. In November, Rembert was voted first team All-America by the American Football Coaches Association. That was the first time any Falcon had made first-team All-America on any list since 1992. He was also voted to the second team of the CBSSports.com All-America Team. Rembert was the only cornerback picked to the AP All-America list who doesn’t play for a program that finished in the Top 25. 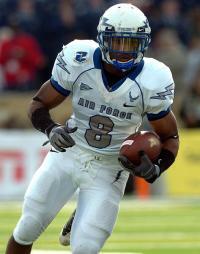 He’s also the only player from a service academy to make the AP All-America Team. This season, Rembert overcame a neck injury in the season opener against Northwestern State before racking up 48 tackles, 3 interceptions and one forced fumble.